California’s grid of the future can be cleaner than it is today, and just as reliable—and many existing gas plants can be retired. California is a global clean energy leader. Roughly 30 percent of the state’s electricity comes from renewable sources, and most of the state’s utilities are on track to meet or exceed long-term clean energy targets. But California still relies on natural gas plants to meet about a third of the state’s electricity demand. These plants provide the grid with flexibility, but also produce air and global warming pollution. Meeting California’s 2030 and beyond climate goals will necessarily involve reducing our dependence on them. 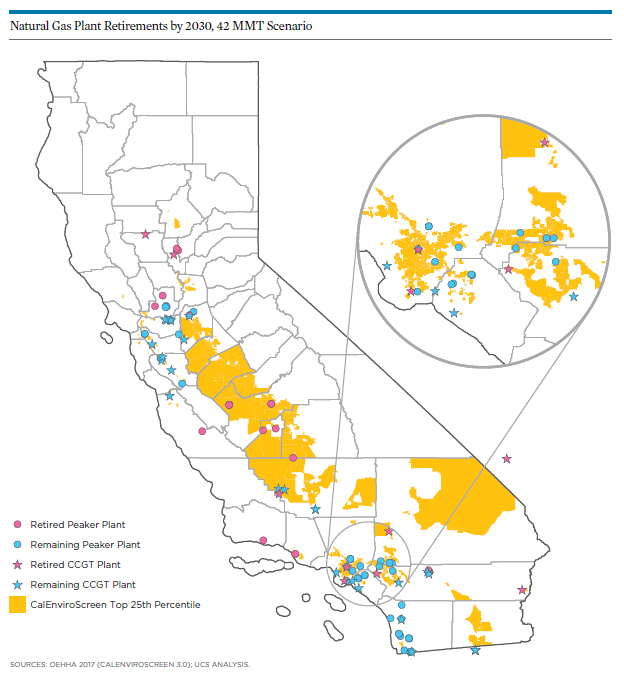 To understand what an orderly and socially equitable transition away from natural gas might look like, the Union of Concerned Scientists analyzed the operations of the 89 natural gas plants located in the territory of the California Independent System Operator, or CAISO—the state’s main grid operator. Dozens of gas plants could be retired by 2030, many of them in communities affected by air pollution. Click to enlarge. 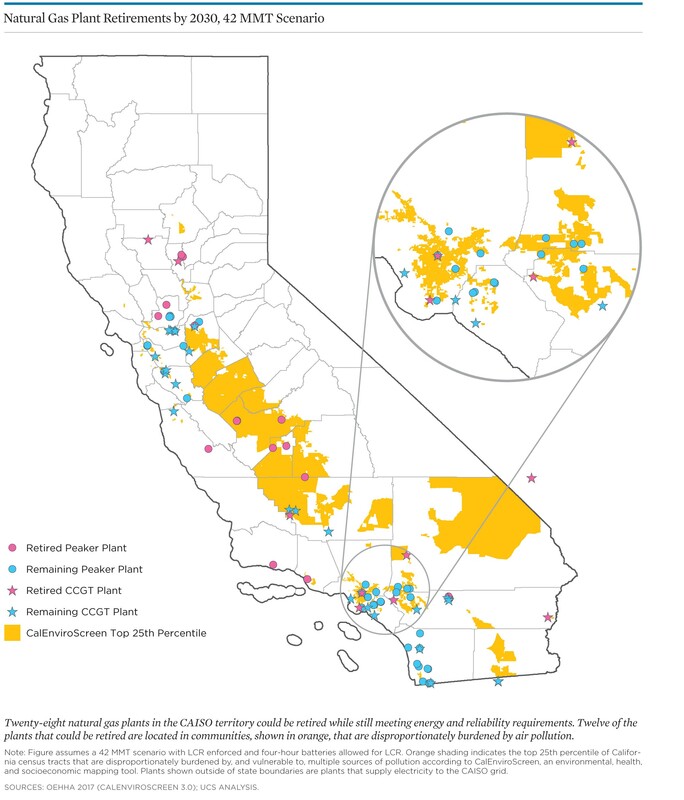 We found that California does not need to build any additional gas plants in the CAISO territory to meet projected 2030 energy or reliability needs. In fact, 28 of the 89 plants analyzed, representing nearly a quarter of generating capacity, could be retired as early as 2018 without negatively affecting grid reliability. Many of the plants that could retire are located in communities disproportionately affected by air pollution. Our analysis shows that significant amounts of wind and solar can be added to California’s grid without needing to build new natural gas plants for reliability. As solar supplies more electricity during the day, natural gas will supply less. In many cases, gas plants will be turned off during the day. This shift will provide substantial global warming pollution reduction benefits. However, solar generation declines as the sun sets. Without cleaner alternatives, gas plants already operating will ramp up generation, and other gas plants will turn back on. Because gas plants can be much dirtier when starting up, this increase in “cycling” could actually increase air pollution from gas plants, possibly worsening air quality in surrounding communities, despite a cleaner grid state-wide. Target specific locations for clean energy and storage investment that provide local reliability needs.